Jammer release 'Party Animal' on January 11th 2009 through Big Dada Recordings. 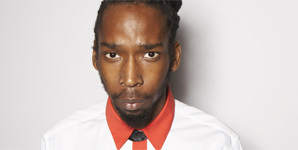 Jammer has been part of the grime scene since its inception and now he's teamed up with producer Toddla T and the result is Party Animal! The single comes with remixes courtesy of Skepta and Hardhouse Banton. Jammer's debut album is set for release on Big Dada in May 2010. The video was shot in one day and directed by Jay K, it sees Jammer moving around a block of flats, visiting various rooms, each with a different party going on.